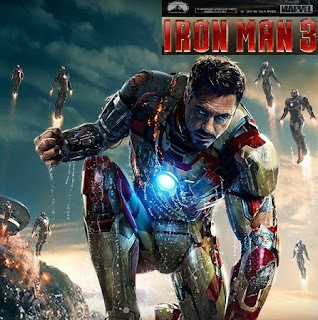 Iron Man 3 - What would be the difference between the Iron Man and a Man who lives on Ironing (Pressing Clothes) if both live with fear and anxiety of failure in protecting their loved ones. It leaves no excitement in watching either and thus this movie fails in entertainment of the audience. Seeing Iron Man feeling like a Barren Man is so very unwelcoming and underwhelming. No much impressing action sequences except a copied theme of Super-Man's Flight saviour act. Though Iron Man does not remain as super human like the 'Man of Steel' by the end of this film and leaves/lives only with name; for any more offerings of this Iron Man Three; away I Run, Man... even if free. Baadshah - A Bad-show in the first half with boring ball philosophy and bullying with bullets. We take a break and then second half starts with the real Brahmi fun, continuing the Director's 'Dreamy' run. Story line pretty similar to this Director's earlier work (Dookudu); and so its saving grace... the ever usable Mr.Brahmanandam, as the crux of it. An eye feast to NTR fans with punchy lines and raunchy dances, though the lyrics and music are on the 'flip (flop) side'. A huge cast with unexpected cameos; as family, friends and foes. A typical Vaitla movie with White Comedy (albeit only half of the film); leave out the first bitter half and the other better half is utterly enjoyable. "నా తదుపరి తరానికి నా మొదటి కవితా కానుక..."